You think your 300mm lens is long enough? Think again. For extreme shots, you need extreme equipment. How about a 1540mm lens? 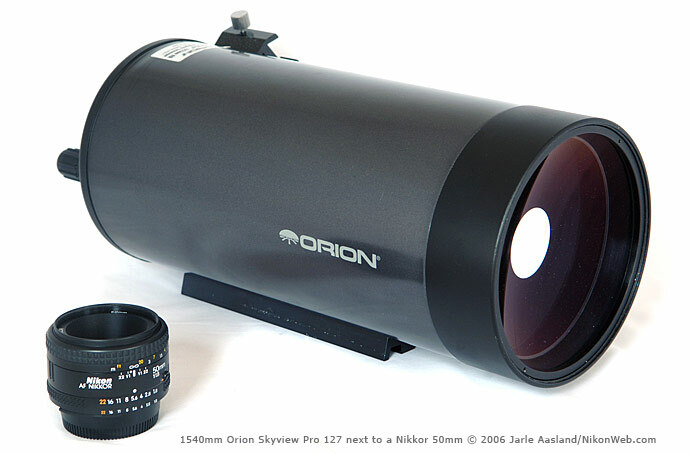 The Orion SkyView Pro 127 (SVP 127 among friends) is really a 5 inch astronomical telescope, featuring a Maksutov-Cassegrain design similar to that used in Nikon's own reflex (mirror) lenses. I primarily got the SVP 127 as an astronomical instrument, but the eyepiece holder accepts a standard T-ring adapter for prime-focus photography, effectively making the telescope work like any other lens. 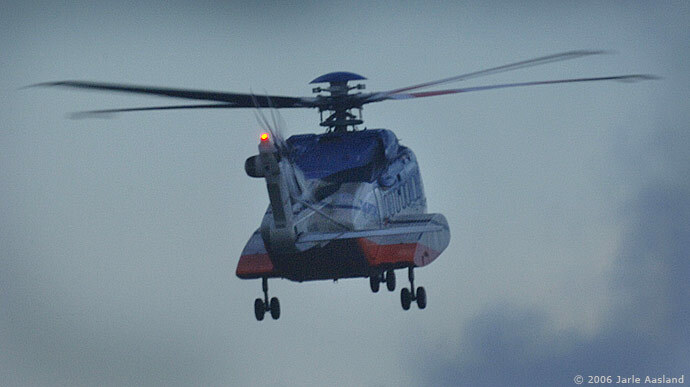 The above photo clearly illustrates what an extra 1490mm will do for you. Another way to illustrate the focal length: A Nikon DSLR (with its 1.5x sensor crop) mounted on the SVP 127 will give you a perfect shot of the full Moon, with just a little space around it. The Earthshine photo to the right is a guided 30 second exposure taken with a D100 mounted on the SVP (only slightly cropped on the sides). 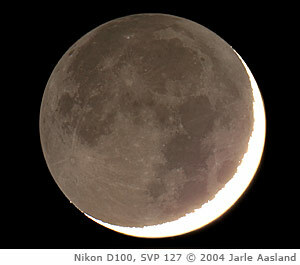 The photo has been published in Sky & Telescope magazine twice. 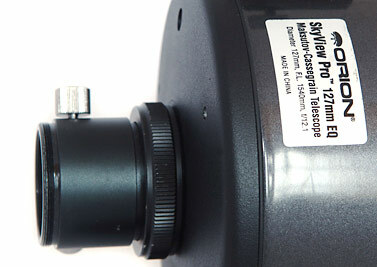 Shooting directly through the telescope without using an eyepiece is referred to as «prime-focus photography». A standard T-ring adapter is all you need. 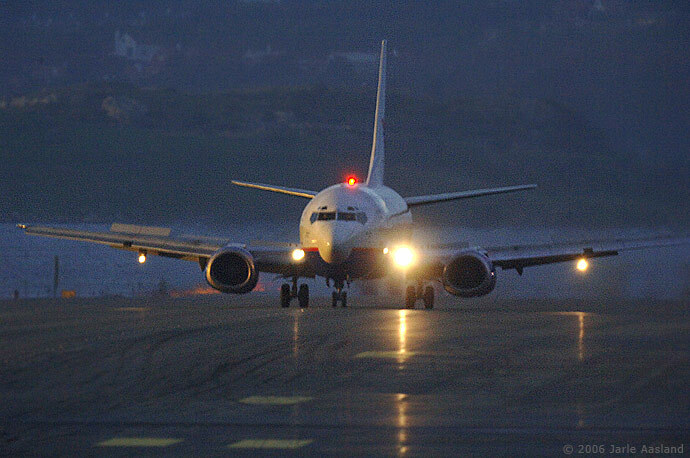 That's what I used for the airport photos in this article. 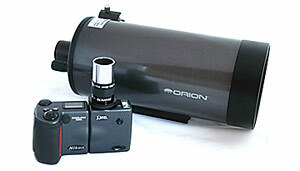 You can even increase magnification by shooting through an eyepiece, so-called afocal photography, but this requires yet another adapter (like Orion's «1.25" Variable Camera Adapter»), and makes it harder to focus and produce good images. When needed, I find it easier to use my Coolpix 990 for afocal photography. 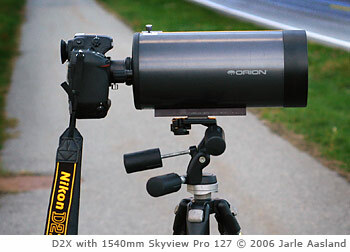 Using a Scopetronix Digi-T adapter (yes, that's the third adapter mentioned in this article) you can easily attach a Coolpix type camera to a regular 1.25" eyepiece (a standard size used by most telescopes). You'll rarely need such extreme focal lenghts, but it's useful for shooting close-ups of the Moon and other specialized tasks. 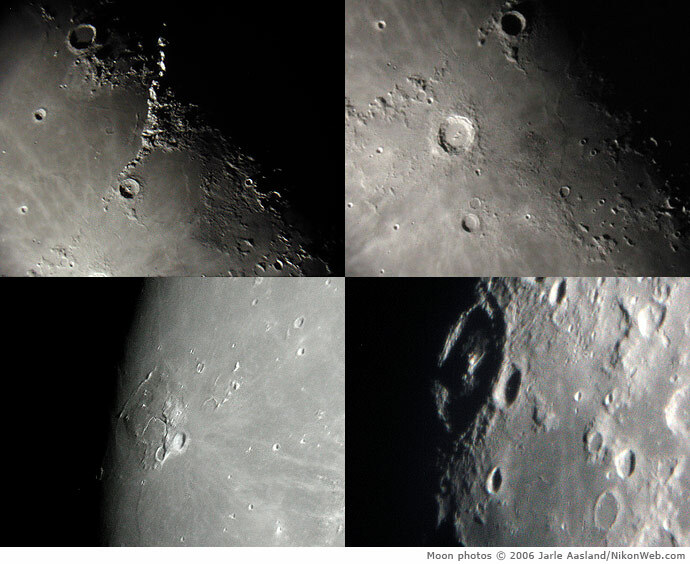 1) Montes Appeninus (Apollo 15 landing site), crater Eratosthenes, Archimedes, etc. 1/4 sec exposure, 100 ISO. 2) Crater Copernicus, 1/8 sec, 400 ISO. 3) Crater Petavius, 1/8 sec, 400 ISO. 4) Vallis Schroter, 1/15 sec, 400 ISO. Unless you're shooting the Moon, most people will never really need a 1540mm lens. I mostly use mine for astronomy, but once in a while it's both fun and challenging to do something different. The aircraft photos on this page were taken especially for this article. 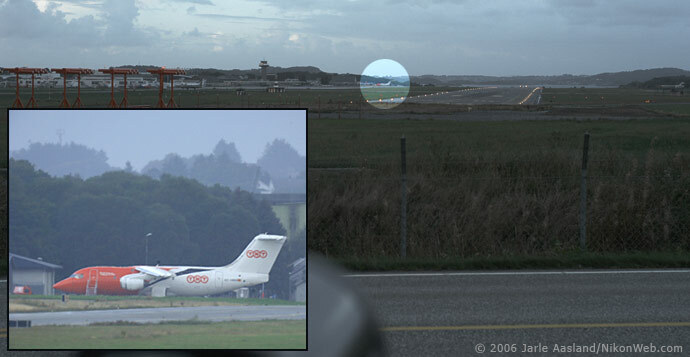 I drove to the local airport, set up the camera just to the south of the main runway and waited for the planes to arrive. Considering the extreme focal length, haze, lighting conditions and less than perfect tripod, I think image quality is pretty impressive. Shooting shortly before sunset, all photos were taken at 800 ISO and shutter speeds around 1/125 sec. 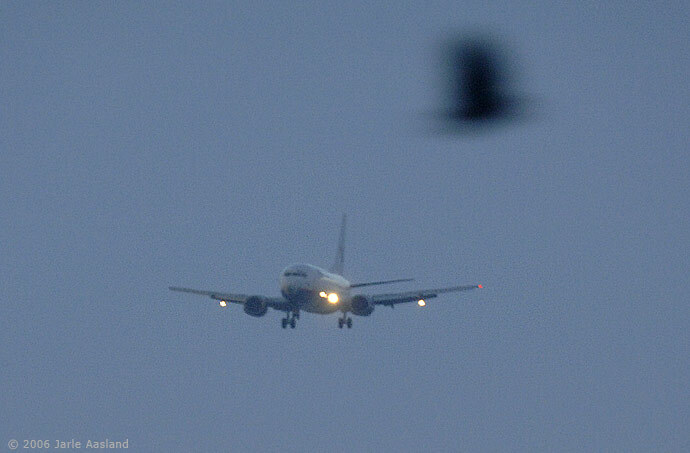 The bird photo was taken at 1/90 sec. using a 1540mm lens! Focusing is one of the biggest challenges using a lens like this. At f/12.1 the viewfinder is relatively dark, and focusing is pretty sensitive. Luckily, using a camera like the D2X or D200, you'll get automatic metering and don't have to worry about the exposure. Just set up the manual lens settings in the camera menu, take a quick test shot (you may have to compensate a little to get a perfect exposure) and start shooting. Like other reflex lenses, contrast is a bit low, but you can easily correct this in Photoshop. No big deal. Finally, I'd like to mention a popular astrophotography technique. Using a regular webcamera (the Phillips Toucam Pro II is a popular choice), you can capture multiple images at extreme magnifications. The captured images (AVI movies, really) can then be stacked using specialized software, producing high resolution images of planets and other objects. Search Google for more information. Pretty cool for a lens that costs less than a Nikkor 300mm f/4.